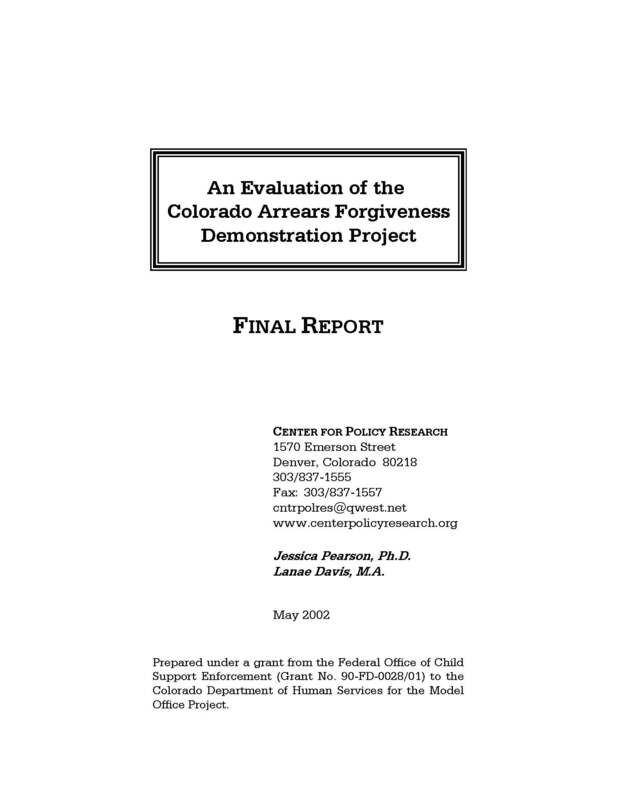 The Colorado Arrears Forgiveness Demonstration Project documents the response of noncustodial parents (NCPs) to an incentive program offering debt forgiveness in exchange for regular and complete payment of child support obligations. NCPs in Jefferson and Larimer Counties with state debts of $1,500 or more were sent letters on fatherhood program letterhead offering forgiveness of all state debts in Larimer or up to $5,000 in Jefferson in exchange for complete and punctual payments of support obligations over a ten-month period of time. Participating NCPs completed a questionnaire at the start of the project eliciting the reasons for their non-payment behaviors. Their child support payment records were checked at the end of the ten-month project along with their UI-wage records for evidence of earnings.